For this egg drop project the goal is to create a padded enclosure which goes around the egg so that, when the egg is dropped from a height, it doesn't break. You want the padding to be soft enough so that it cushions the egg from high impact forces (during landing), and you want the padding to be thick enough so that it deforms during the entire duration of impact. If it's too thin it will reach its maximum deformation before the impact is over and the egg will break. Therefore it must be as thick as possible. You can use foam, leaves, feathers, or anything which is soft and can absorb an impact. If the egg breaks you need to make the cushion material softer, thicker, or both. You can also build a frame around the padded enclosure so that it flexes and deforms during impact (landing), therefore absorbing some of the impact energy, and acting as an additional buffer of protection between the impact forces and the egg. You can build this frame with thin tree branches which are flexible and strong. 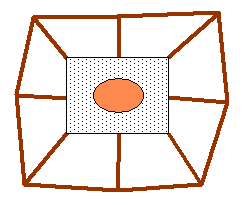 The figure below shows a basic concept design for the egg drop enclosure plus surrounding frame, based on what was talked about here.